One of the most tempting things to do when you are off on an amazing adventure is to get up close and personal with wild animals. Due to different animal welfare regulations, it is often possible to do things like ride elephants or cuddle baby lions. I would urge you to be very, very careful and to do a lot of research about exactly what you are supporting before handing over your money. That photo you just took with a lion cub has far reaching implications. 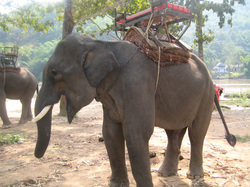 That ride you just took on the back of an elephant was only possible because of the torture they put the elephant through first. Please take the time to educate yourself and do not contribute to horrific animal abuse. Did you know that riding elephants can actually cause serious long-term harm? Their spines are not made to support the weight of humans. I know it’s hard to believe given their size, but Zebras are the same way. Most people who participate in elephant tourism are completely unaware of how they are treated. The cubs used for petting exhibits are torn from their mothers shortly after birth, causing emotional pain to both the cubs and the mothers. Imagine what that mother experiences after enduring the long pregnancy and finally giving birth, filled with the instincts to nurture her cubs, and then having them snatched away. The breeders take them away and have people handle them so the cubs will “imprint” on the people instead of doing what is natural and imprinting on their mothers. The cubs are then destined for a horrible existence after they are too big to use to make money. So Is There a Humane Way to Interact With Animals? Well, this depends on where your own personal ethics lay. Some people feel that there is no way to interact with wild animals that does not cause them harm in some way. In a perfect world, I actually tend to agree with these people. However, we live in an imperfect world. Many conservation efforts rely on donations and public funding to exist. Letting the public interact with animals, letting them see the animal up close and learn about their plight means they often take that inspiration home. Sharing the story of animals is a big part of conservation efforts, just as much as research and field work. One example of this is Cheetah Outreach in South Africa. This rather amazing organization is truly dedicated to conservation. Their ambassador cheetahs help to teach the public, schools, communities and farmers about the terribly real possibly of extinction in the coming years. They work to provide solutions such as providing trained dogs that protect livestock and reduce the friction between farmers and predators. You can read more about this organization in the wonderful article National Geographic did on them. There are many other examples out there of amazing people and organizations who are making a positive difference and there are ways to meet and interact with animals that are as non-intrusive and non-stressful as it is possible to be. You just have to be willing to do some homework and seek them out. Look for outside verification of the organization, ask questions about where the animals come from and how they are cared for and remember that interactions should always be short and not involve any un-natural behavours. I can't really express how much I would have loved to have cuddled the lion cubs when I was in South Africa. I adore big cats. 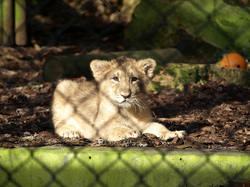 But I simply couldn't put my wish to spend five minutes with a cub above the cub's welfare. So I did a lot of reading, and found the Cheetah Outreach, which was an organization I was ethically okay supporting. One of the more amazing experiences of my life.